A Christian's determination to expose the truth is behind a new feature film, which claims to reveal a dark secret about the aviation industry. 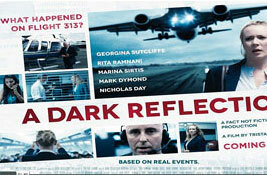 A Dark Reflection has just premiered in Horsham, West Sussex – 12 miles as the crow flies from Gatwick Airport. The film claims to expose "a secret the airlines don’t want us to know" – that toxic fumes are mingling with the air in some aircraft cabins – to lethal effect. A former Methodist minister was one of the first to expose the problem. And a producer on the film says she wanted to make the movie because of the Biblical mandate to expose injustice and bring wrongdoing to light. The film’s premiere has coincided with a coroner’s investigation into the death of an air captain, allegedly brought on by poisonous fumes from jet engines. A senior coroner investigating the death of BA pilot Richard Westgate in February raised the alarm over fumes being pumped into aircraft cabins – including those of passenger jets. Sheriff Stanhope Payne warned the health of regular fliers could be damaged by breathing the fumes, and called on BA and the Civil Aviation Authority to take "urgent action to prevent future deaths". Pilot Richard Westgate was forced to retire in 2006 after suffering numbness and disorientation on long flights. The Wiltshire pilot died six years later, at the age of 43. The greatest risk to passenger safety could come from pilots and cabin crew falling ill. Suspected symptoms include blurred vision, nausea and loss of balance. The danger arises from the practice of bleeding air into cabins from the engines. Any leak in the oil seals could lead to poisonous organophosphate additives contaminating the air supply to passengers and crew. It’s claimed that hundreds of regular fliers have been affected by Aerotoxic Syndrome. One of the first to expose the problem was former Methodist minister John Woodley, who appears in A Dark Reflection. The Rev Woodley first became aware of Aerotoxic Syndrome when Lesley, an attendant on his regular flight, fell ill.
From lively, bright and attentive, he says she became sick, pale and withdrawn. A former senator in the Australian parliament, Rev Woodley told a Senate inquiry in October 2000: "Lesley represented the human face of the debate which has raged around her condition and that of hundreds of other pilots and flight attendants worldwide." That debate about whether engine fumes make passengers and crew sick continues to rage. The latest salvo has been fired by former BA captain, turned film director, Tristan Loraine (pictured below, right). Mr Loraine says he was forced to retire from flying due to Aerotoxic Syndrome (outlined in John Hoyte's book, cover above), which left him feeling numb and with lapses of memory. He claims to have known another pilot – besides Peter Westgate ­– who had similar symptoms and died of a brain tumour, aged 44. Loraine’s film follows the fictional investigation of journalist Helen Eastman (actor Georgina Sutcliffe) into an alleged cover-up after an air captain dies. Could he have been poisoned by fumes? Senior Assistant Producer Sarah Holloway (left in picture) says it was her Christian faith that drew her to highlight the problem. "It appears the airline industry is choosing profit over public health, and that should be exposed. "The Bible tells us to expose injustice and bring to light what is wrong. This is an important film. I hope it will be a catalyst for change." While not a Christian film as such – Sarah says she was the only Christian on the production team – other Christians helped with providing prayer support, supplying props and offering locations for filming. The film’s premiere, coinciding with the coroner’s damning report into a real-life airline death, has propelled the issue of Aerotoxic Syndrome into the headlines. The airline industry has been denying any connection between cabin fumes and ill-health since 1999. But In the words of Senior Dorset Coroner, Sheriff Stanhope Payne: "In my opinion there is a risk that future deaths will occur unless action is taken." Film director and former pilot, Tristan Loraine, has called for aircraft to be modified to ensure air entering the cabin is fresh – and is no longer pumped in via the engines. "I believe this film will play an important role in making air travel safer," he says. "It will raise awareness on a flight safety issue that few passengers know anything about – which has been withheld from the public for more than 50 years."